The Undergraduate Research and Creative Works (URCW) program encourages and supports the establishment of collaborative partnerships between nurturing faculty mentors and enterprising students. Within these partnerships, critical inquiry, brainstorming, debate, and mutual discovery intertwine, leading over time to the production of finished works suitable for publication, exhibition, or presentation in either professional or public forums. In this way, the overarching goal of the URCW program is to provide students with inquiry based or creative opportunities for experiences that many students would receive only in graduate school or the professional world. 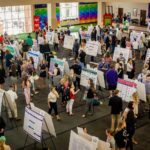 The mission of the Office of Undergraduate Research and Creative Works program at High Point University is to engage undergraduates in student-faculty collaborations that reflect individual and unique scholarly and imaginative experiences which promote the development of new competencies and foster critical thinking, and provide students with privileged opportunities to add to the sum of human knowledge. With a small donation, you can recognize a student’s presentation or publication, honor a mentor, pay it forward. 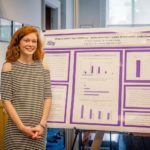 The Office of Undergraduate Research and Creative Works helps students and mentors attend conferences, competitions, and performances.